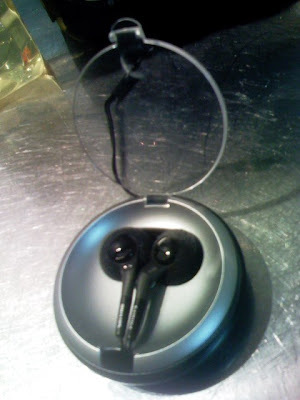 Some time ago, I blogged about getting a "generic" headset and tweaking it to fit the iPhone socket proved to be one of the popular posts in this blog. Well, I just found an easier way to get an iPhone headset short of buying those expensive ones! 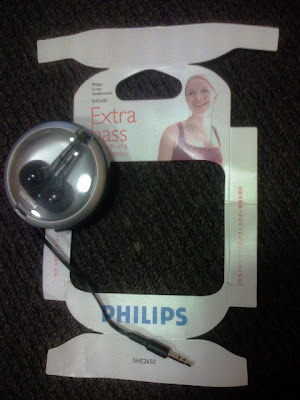 Buy the Philips SHE2650 Extra Bass headphones. It fits snugly into the iPhone! No need to cut off rubber from the jack to make it fit! I made this discovery by accident, actually. I...um... lost the headset I operated on and we were in our last-minute shopping prior to packing everything up for New Zealand so I just grabbed these headsets. It's priced at about 400 pesos (80 US dollars?). It's one of the cheaper headsets so don't expect top-notch sound reproduction, though. I feel it needs more oomph in the bass area (considering it's extra bass!) but the mid - and high-range sounds are ok. This headset features its own nifty carrying case. Considering that I no longer had to do surgery on the thing and the audio is ok, this is a great value if you're the type who tends to lose (or damage) headsets regularly. Like me.